On a beautiful Friday afternoon in Indianapolis, the dedication of the Millard Fuller Legacy Build began. Over 60 people gathered on St Paul Street in the Fountain Square area of Indy. The sun was shining and enthusiasm reigned. All 6 of our Fuller Center families were represented. You could just see on their shining faces the anticipation and excitement of the project. Several families brought their children. They watched wide-eyed as one of the houses was demolished to make way for their new home. One of the families has 2 little girls. These girls make their mother drive down the street each night before bedtime to see where their new home will be. They are so excited about having their own house, their own rooms and to live in a neighborhood with other Fuller Center families. It’s for these little girls and for other children that this project means so much. We are not only building houses, but we are building neighborhoods and communities where a generation of families will be home. Come and join us in September as we make these dreams come true. 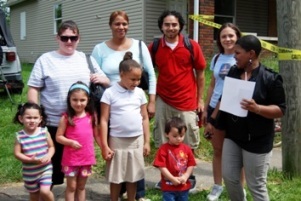 See for yourself the look on their faces and the joy in their hearts as we build together a new neighborhood.